In last week’s blog post, we discussed one kind of non-surgical treatment for foot and ankle problems – amniotic stem cell therapy – that utilizes and enhances the body’s own natural healing functions to effectively address pain and speed the recovery process. But stem cells are only one form of regenerative medicine we practice at JAWS podiatry. We also take advantage of the healing and curative properties contained in bone marrow to safely repair damage and relieve pain so patients can get back on their feet quickly without the need for surgery. Bone marrow therapy has been safely and effectively used for years to treat a variety of ailments. The reason this treatment works is because of the power of the stem cells found in our bones. Stem cells contain powerful anti-inflammatory properties which help restore healthy functioning and repair damaged tissue throughout the body. Unlike cortisone and other anti-inflammatory drugs which only provide temporary pain relief, stem cells actually restore damaged tissue while providing pain relief at the same time. In amniotic stem cell therapy, we use stem cells from donors who must go through an extensive screening process approved by the Food and Drug Administration (FDA) and American Association of Tissue Banks (AATB) before they can be used for therapeutic purposes. But bone marrow therapy uses the patient’s own stem cells rather than a donor’s. Typically, we extract these powerful cells from the heel bone using a special needle which draws out the cells in a syringe, along with other elements found in the marrow. The product is then spun in a centrifuge to filter the stem cells from the other elements. These cells are then injected into the damaged tissue where they enhance the healing already being done by your body’s natural processes. In many respects, bone marrow therapy is very similar to platelet rich plasma therapy (PRP) injections, another form of regenerative therapy we often use. 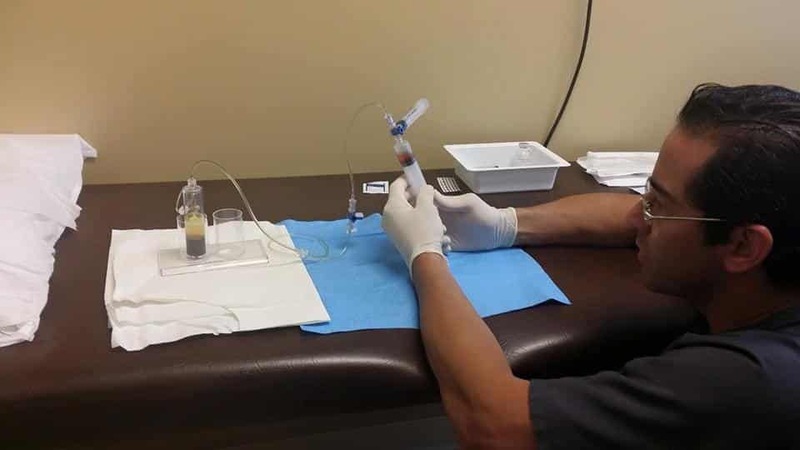 In fact, bone marrow stem cells and PRP injections are sometimes used in combination when appropriate to further encourage pain relief and tissue repair. You should discuss with your physician whether bone marrow therapy is a viable treatment option for you. At JAWS podiatry in Hollywood, Florida, we know how painful and frustrating foot or ankle problems can be. We also understand that you want to resolve any such problems as quickly and as easily as possible. That is why we utilize the most advanced and non-invasive techniques to reduce pain and speed recovery, including regenerative medicine and bone marrow therapy. If you’d like to learn more about the innovative and effective treatments we provide or how we can help you with your foot and ankle issues, please contact us today at (954) 922-7333 to schedule a consultation.